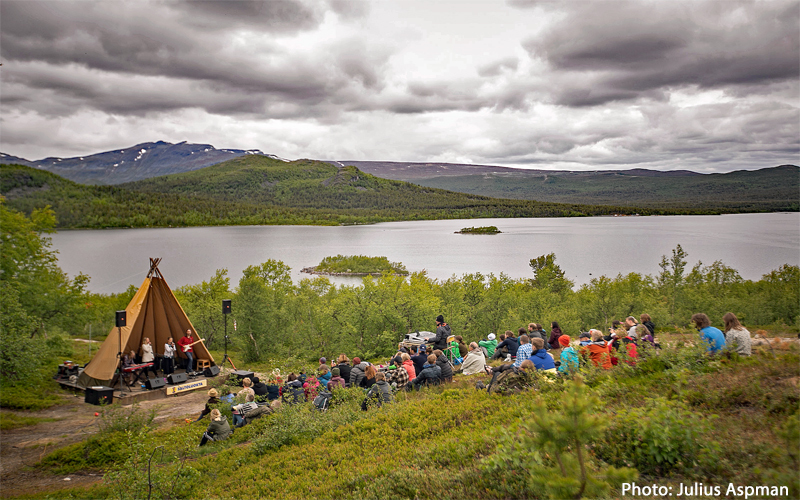 Hike along Kungsleden, the most famous trail in Sweden, and experience the festive atmosphere at Saltoluokta Folk music festival. In the end of June we have 24-hour of daylight and there is no rush to get back to the hut in the evening. We stay an extra dag by the homestead in Aktse and make a day tour upp to Skierfe. 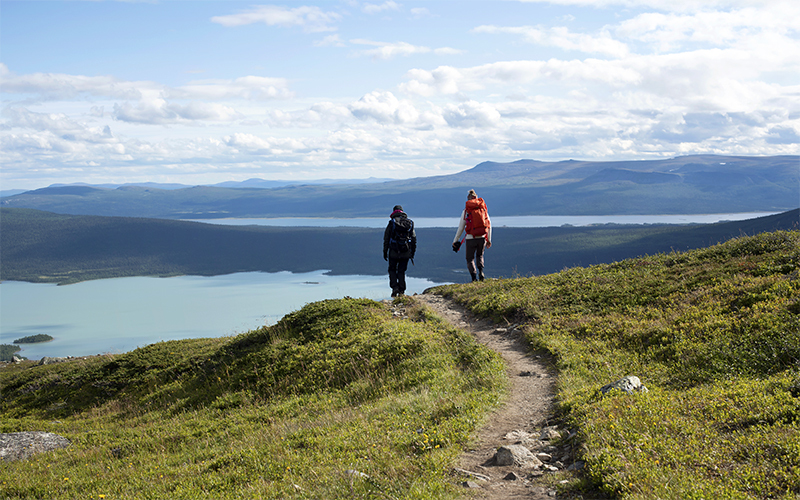 From here you can look out over the turquoise Rapa river colored by the many glaciers inside Sarek national park. 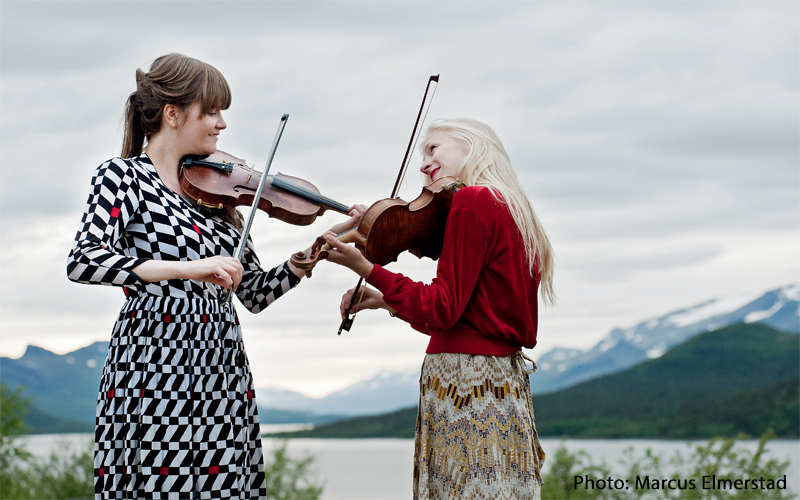 Every year Saltoluokta mountain lodge open there arms to folk music and traditional dancing. Many of the concerts are taking place at the outdoor scene with the mountains and the lake in the background. Every day there are workshops in traditional dancing or joiking where you can learn the basics to be part of the dancing in the evening. To get to Saltoluokta folk music festival you either travel by boat or like us, by fot across the mountains. 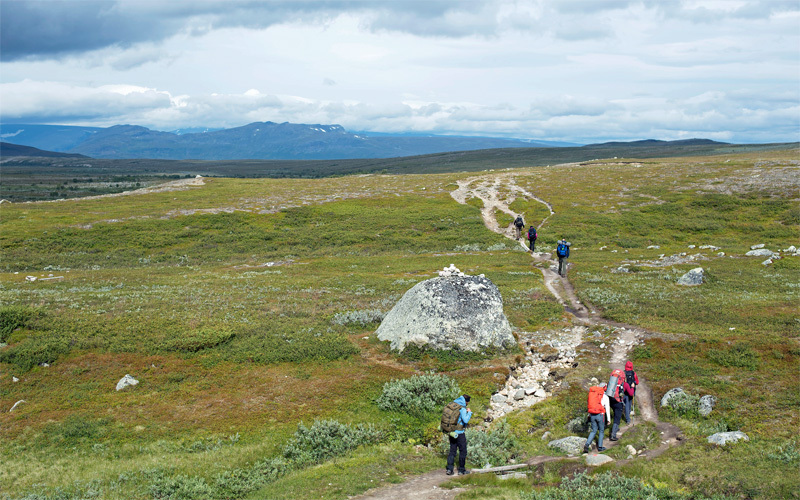 …wants to hike Kungsleden and experience the music festival at Saltoluokta mountain lodge. You should be able to hike between 10-20 kilometer per day in terrain with moderate differences in altitude and with a backpack of around 10-12 kg. Please contact us if you have any questions regarding your physical ability or experience level. 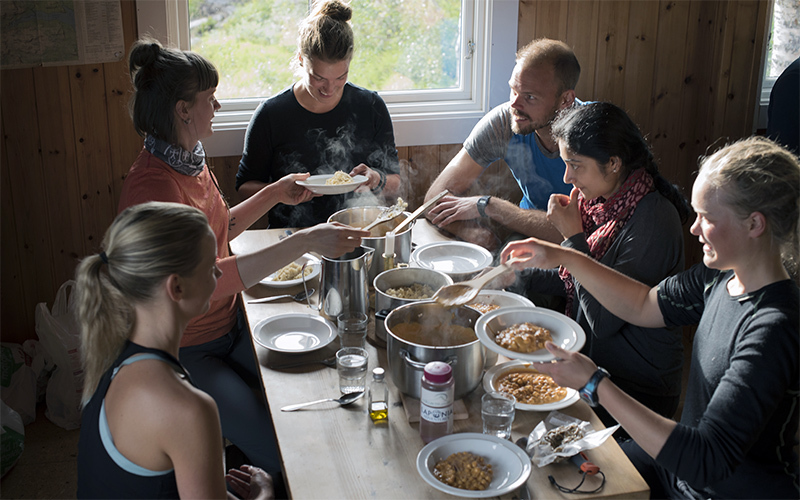 Laponia Adventures values nutritious food made from real ingredients and put a lot of effort into preparing the menu for this hike. We use local ingredients such as reindeer meat and local fish but we also cook typical Swedish food. We start the days with a Swedish breakfast and in the evening, we cook dinner together in the hut. As long as weather permits we will have a longer break during the day to re-energize with a lighter lunch. The first day of the tour we will stay in hostels where you will share a room with other participants of the group. During our time along Kungsleden we stay in cozy mountain cabin without electricity or running water. We all help with the daily duties such as cooking or chopping wood to the fire. Even if the cabins are simple, they provide the most essentials as heat, beds, blankets and cooking utensils. Outhouses are often situated within 100 meters from the huts. The last night we stay in a Tentipi close to Saltoluokta mountain lodge. You will of course have access to both water-toilets and showers but also a sauna. We work with local guides who have good knowledge of the culture and history in Laponia. They are all certified guides trained in wilderness first aid or live up to the same standard or higher. 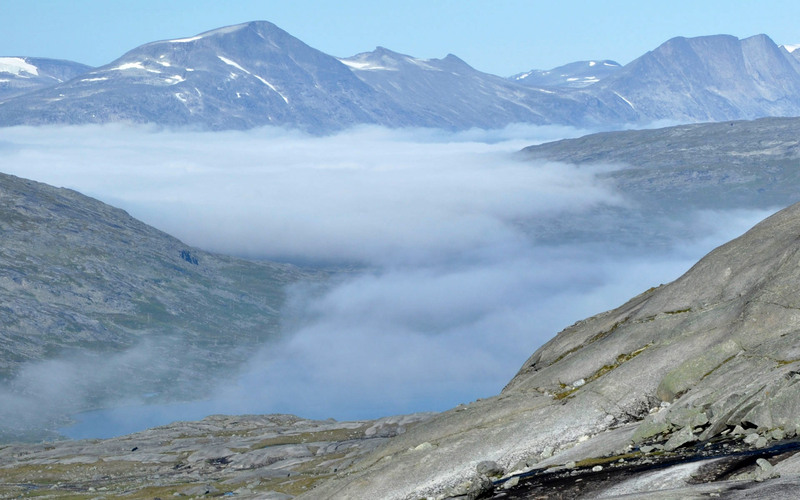 Our support team will drive us to Sitoälvsbron where we start the hike and also make sure your travel luggage ends up in Saltoluokta mountain lodge where we finish. Jokkmokk is a small town just north of the Arctic Circle not far away from the mountains of Laponia. 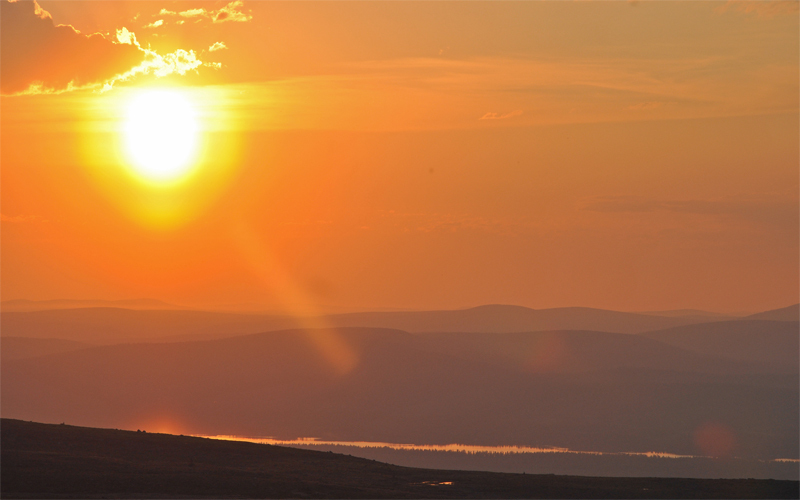 The first night you will stay at Jokkmokk Hostel where you’ll share a room with other hikers from the group. We meet up for dinner (18.00) and enjoy our first meal together followed by an introduction to the week. If you arrive early we recommend you to visit Ájtte – the mountain and Sami museum. For you who travel here by bus we recommend that you get of at Åsgatan right outside the hostel. We arrange transfer from the airports in Luleå. Pick-up latest 16.00. We start the day with breakfast at the hostel before we pack the minibus and head west to Sitoälvsbron where our hike begins. As we travel west the trail gets more narrow and pointy peaks start rising in the horizon. Our walk ends in Aktse cabin where we have dinner and stay the first night. We climb the hill behind the hut towards Skierfe, a characteristic mountain from where you can look out over the meandering river in the Rapa delta. 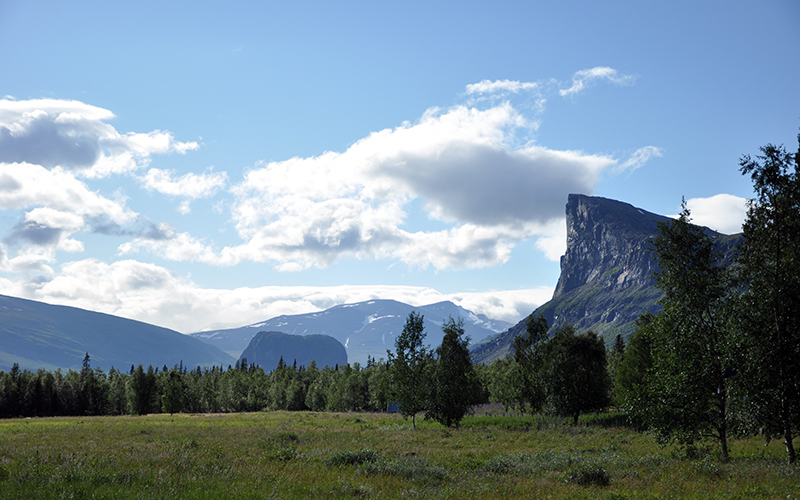 We hope for good weather to be able to see far into Sarek national park. The trail leads us up through the birch forest to the open landscape above the three line. We hike north along Kungseden, taking time to enjoy the view before we continue down to lake Sitojaure. A boat will take us over to Sitojaure cabin on the other side of the lake. Our last hiking day takes us through a wide U-shaped valley that divides the high mountains in the west from the rolling hills of Ultevis in the east. We enjoy our last full day in the mountains before reaching Saltoluokta mountain lodge where we have shower and sauna and enjoy the festive atmosphere at the Saltoluokta folk music festival. After finishing the organic breakfast in the restaurant at Saltoluokta mountain lodge it is time to say good-bye and wish you safe travels home. A boat will take you across lake Langas and we recommend you to arrange your travel home from Kebnats bus stop on the other side. We recommend that you stay another day in Saltoluokta to experience more of the festival. A normal day in the end of June offers temperatures from 5 to 20 degrees. Temperature can drop down to 0 degrees and we could get strong winds, lots of rainfall or potentially snow. The mosquitos starts to come this time of the year but normally it peaks a few weeks later.